Michol O'Connor, Richard McElvaney, et al. O'Connor's property code plus. 2011-2012 ed. Jones McClure Pub., c2011. This book, co-authored by Professor Richard McElvaney, contains a comprehensive, up-to-date collection of Texas statutes and case annotations on real estate and property law covering topics such as annexation, land use, takings, property taxes, judgment interest, water rights, hazardous conditions, antiquities, and secured transactions. Also included are charts listing attorney-fee provisions, statutes of limitations, and injunction provisions; timetables for eviction and condemnation suits; and derivation and disposition tables for the Property Code. Dee Pridgen, Richard Alderman. Consumer credit and the law. 2011-2012 ed. Thomson West, c2011. 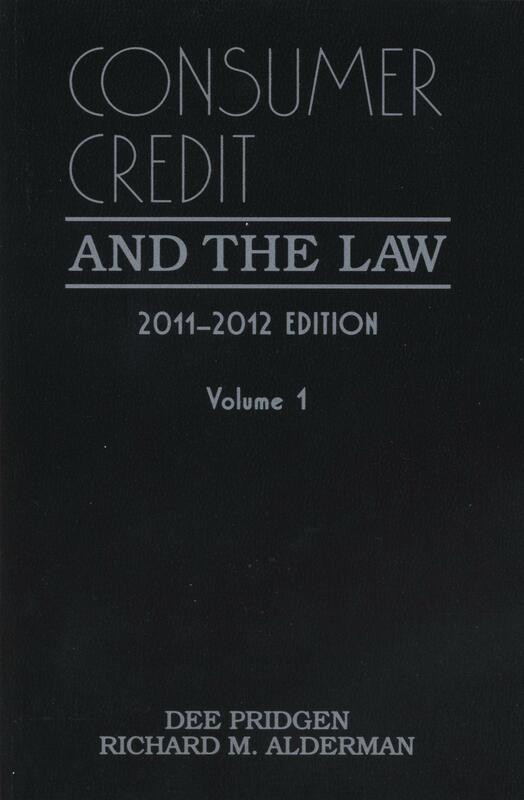 This two volume work, co-authored by Associate Dean Richard Alderman, is written for both those advising creditors and those representing the consumer. It mirrors the chronological sequence of events in a consumer credit transaction and coverage includes obtaining credit, Truth-in-Lending disclosures, regulation of the price of credit, debt collection, and the credit consumer's remedies for various problems. A unique appendix, organized by state, provides individual state laws on credit discrimination, credit reporting, holder in due course, and cooling off periods. H. Stephen Harris, Jr., et al. Anti-monopoly law and practice in China. Oxford University Press, c2011. The world ocean in globalisation : climate change, sustainable fisheries, biodiversity, shipping, regional issues / edited by Davor Vidas, Peter Johan Schei. Martinus Nijhoff Publishers, 2011. Jack M. Balkin. Living originalism. Harvard University Press, 2011. J.G. Merrills. International dispute settlement. 5th ed. Cambridge University Press, c2011. Amory B. Lovins, Rocky Mountain Institute. Reinventing fire : bold business solutions for the new energy era. Chelsea Green Pub., c2011. Stewart Brand. Whole earth discipline : an ecopragmatist manifesto. Viking, 2009. Environmental issues in business transactions / edited by Lawrence P. Schnapf. American Bar Association, Business Law Section, c2011. William H. Rodgers, Jr., et al. Climate change : a reader. Carolina Academic Press, c2011. Linda J. Ravdin. Premarital agreements : drafting and negotiation. American Bar Association, Section of Family Law, c2011. Greg Siskind. The employer's immigration compliance desk reference. Society for Human Resource Management, c2009. The immigration law sourcebook : a compendium of immigration-related laws and policy documents. American Bar Association, c2011. David Scorey, Richard Geddes, Chris Harris. The Bermuda form : interpretation and dispute resolution of excess liability insurance. Oxford University Press, c2011. United Nations. Multilateral treaty framework : an invitation to universal participation : 2010 treaty event : towards universal participation and implementation. United Nations, 2010. Alexander Gillespie. A history of the laws of war. Hart Publishing, 2011. Sharia incorporated : a comparative overview of the legal systems of twelve Muslim countries in past and present / edited by Jan Michiel Otto. Leiden University Press, c2010. Leo Katz. Why the law is so perverse. University of Chicago Press, c2011. James E. Clapp, et al. Lawtalk : the unknown stories behind familiar legal expressions. Yale University Press, c2011. Nina J. Crimm, Laurence H. Winer. Politics, taxes, and the pulpit : provocative First Amendment conflicts. Oxford University Press, c2011. Law and the illicit in medieval Europe / edited by Ruth Mazo Karras, Joel Kaye, E. Ann Matter. University of Pennsylvania Press, c2008. The future of family property in Europe / edited by Katharina Boele-Woelki, Jo Miles, Jens M. Scherpe. Intersentia, c2011. Thomas Lee Hazen. Securities regulation. American Bar Association, General Practice, Solo & Small Firm Division, c2011. Louis Loss, Joel Seligman, Troy Paredes. Fundamentals of securities regulation. 6th ed. Wolters Kluwer Law & Business, c2011. Michael A. Bailey, Forrest Maltzman. The constrained court : law, politics, and the decisions justices make. Princeton University Press, c2011. U.S. preference programs : options for reform : hearing before the Committee on Finance, United States Senate, One Hundred Eleventh Congress, second session, March 9, 2010.
International counternarcotics policies : do they reduce domestic consumption or advance other foreign policy goals? : hearing before the Subcommittee on Domestic Policy of the Committee on Oversight and Government Reform, House of Representatives, One Hundred Eleventh Congress, second session, July 21, 2010. Filing season update : current IRS issues : hearing before the Committee on Finance, United States Senate, One Hundred Eleventh Congress, second session, April 15, 2010. From molecules to minds : the future of neuroscience research and development : hearing before the Subcommittee on Domestic Policy of the Committee on Oversight and Government Reform, House of Representatives, One Hundred Eleventh Congress, seconds session, September 29, 2010. Implementation of the Magnuson-Stevens Fishery Conservation and Management Act : hearing before the Subcommittee on Oceans, Atmosphere, Fisheries, and Coast Guard of the Committee on Commerce, Science, and Transportation, United States Senate, One Hundred Twelfth Congress, first session, March 8, 2011. Oversight of the Department of Housing and Urban Development (HUD) : hearing before the Committee on Financial Services, U.S. House of Representatives, One Hundred Twelfth Congress, first session, March 1, 2011. Response efforts to the Gulf oil spill : hearing before the Committee on Commerce, Science, and Transportation, United States Senate, One Hundred Eleventh Congress, second session, May 18, 2010. SAFE Port Act reauthorization : securing our nation's critical infrastructure : hearing before the Committee on Commerce, Science, and Transportation, United States Senate, One Hundred Eleventh Congress, second session, July 21, 2010. Innovation in America : opportunities and obstacles : hearing before the Subcommittee on Competitiveness, Innovation, and Export Promotion of the Committee on Commerce, Science, and Transportation, United States Senate, One Hundred Eleventh Congress, second session, June 22, 2010. The trade advisory committee system : hearing before the Committee on Ways and Means, U.S. House of Representatives, One Hundred Eleventh Congress, first session, July 21, 2009. Taxes as part of the federal budget : hearing before the Subcommittee on Select Revenue Measures of the Committee on Ways and Means, U.S. House of Representatives, One Hundred Tenth [i.e. Eleventh] Congress, second session, March 23, 2010. War powers, United States operations in Libya, and related legislation : hearing before the Committee on Foreign Affairs, House of Representatives, One Hundred Twelfth Congress, first session, May 25, 2011. Made in America : innovations in job creation and economic growth : hearing before the Subcommittee on Commerce, Manufacturing, and Trade of the Committee on Energy and Commerce, House of Representatives, One Hundred Twelfth Congress, first session, March 3, 2011. Reauthorization of the Satellite Home Viewer Extension and Reauthorization Act : hearing before the Subcommittee on Communications, Technology, and the Internet of the Committee on Energy and Commerce, House of Representatives, One Hundred Eleventh Congress, first session, February 24, 2009. Energy efficiency : complementary policies for climate legislation : hearing before the Subcommittee on Energy and Environment of the Committee on Energy and Commerce, House of Representatives, One Hundred Eleventh Congress, first session, February 24, 2009. The Homeland Security Department's budget submission for fiscal year 2010 : hearing before the Committee on Homeland Security and Governmental Affairs, United States Senate, of the One Hundred Eleventh Congress, first session, May 12, 2009. Cyber security : hearing before the Committee on Energy and Natural Resources, United States Senate, One Hundred Twelfth Congress, first session, to receive testimony on a joint staff discussion draft pertaining to cyber security of the bulk-power system and electric infrastructure and for other purposes, May 5, 2011. The Electronic Communications Privacy Act : promoting security and protecting privacy in the digital age : hearing before the Committee on the Judiciary, United States Senate, One Hundred Eleventh Congress, second session, September 22, 2010. The DC Opportunity Scholarship Program : keeping the door open : hearing before the Subcommittee on Health Care, District of Columbia, Census, and the National Archives of the Committee on Oversight and Government Reform, House of Representatives, One Hundred Twelfth Congress, first session, March 1, 2011. The 2010 election : a look back at what went right and wrong : hearing before the Subcommittee on Elections of the Committee on House Administration, House of Representatives, One Hundred Twelfth Congress, first session, held in Washington, DC, March 31, 2011. Protecting youths in an online world : hearing before the Subcommittee on Consumer Protection, Product Safety, and Insurance of the Committee on Commerce, Science, and Transportation, United States Senate, One Hundred Eleventh Congress, second session, July 15, 2010. The American energy initiative : hearing before the Subcommittee on Energy and Power of the Committee on Energy and Commerce, House of Representatives, One Hundred Twelfth Congress, first session. U.S. military leaving Iraq : is the State Department ready? : hearing before the Subcommittee on National Security, Homeland Defense, and Foreign Operations of the Committee on Oversight and Government Reform, House of Representatives, One Hundred Twelfth Congress, first session, March 2, 2011. Time to pause the reset? : defending U.S. interests in the face of Russian aggression : hearing before the Committee on Foreign Affairs, House of Representatives, One Hundred Twelfth Congress, first session, July 7, 2011. Protecting consumers from deceptive debt settlement schemes : field hearing before the Committee on Commerce, Science, and Transportation, United States Senate, One Hundred Eleventh Congress, second session, August 12, 2010. Media ownership : hearing before the Committee on Commerce, Science, and Transportation, United States Senate, One Hundred Eighth Congress, first session, May 13, 2003. Why Taiwan matters : hearing before the Committee on Foreign Affairs, House of Representatives, One Hundred Twelfth Congress, first session, June 16, 2011. Turning ideas into action : ensuring effective clean up and restoration in the Gulf : hearing before the Subcommittee on Oceans, Atmosphere, Fisheries, and Coast Guard of the Committee on Commerce, Science, and Transportation, United States Senate, One Hundred Eleventh Congress, second session, July 21, 2010.